Causal layered analysis is a futures research method focusing on in-depth analysis of current issues and identifying alternative futures. The analysis happens on four levels: litany, social or systemic causes, discourse/worldview and myth/metaphor. Litany identifies current issues, assumptions, facts and data. At the next layer the social or systemic causes underlying the 'litany' are analysed. At the discourse layer, dominant worldviews and mindsets are examined, which give rise to the issues. The deepest layer looks at the foundational myths, metaphors and archetypes that influence the unconscious and/or emotional undertone beneath the issues. After understanding the layered causes of an issue, the method suggests looking at alternatives – either within each layer or beginning with a new myth/metaphor and working up through the layers to create an alternative scenario. From this alternate scenario, new possibilities can be distilled and translated into solutions, policies, and other types of actions that one can begin implementing in the present. Step 4: after reaching the bottom layer, pick a different myth/narrative and create a scenario by moving up the other layers, up to the new events and behaviours in litany. A minimal spatial setup for this technique requires a semicircle of chairs facing a large vertical writing surface (black/whiteboard, large piece of paper…). Depending on the size of the group, you might need to have break-out discussions as well. Step 1: Frame the exercise, explain the gradual movement down through the 'causal layers', and the goal of the exercise. Let the participants know that you will ask questions to guide the discussions. Step 3: When the issue(s) is/are clearly formulated, move to the next layer: (social) causes, where the issue is analysed based on economic, social, cultural, political and environmental factors. Invite the participants to examine how and why the issue arose. What factors are influencing the issue? Who is involved? What are the underlying causes? Note down summaries of the answers and cluster them thematically. Step 4: The next layer to examine is the discourse/worldview layer, which includes the (hidden) social, cultural and even linguistic structures that remained unquestioned by the analysis in the previous layer. This layer looks at cultural values behind the 'powers' that perpetuate the litany. What are the (hidden) assumptions behind the issue(s)? Who are the stakeholders? What are the values they appear to have? Who has the most control over the issue, and what are their dominant worldviews or ideologies? Cluster the discussions into a few dominant worldviews. Step 5: The deepest layer is one of myth and metaphor, including collective archetypes and emotional dimensions underlying the worldviews. Discussion about this layer can take different formats, from a simple conversation to working more visually (e.g. using moodboards). However you decide to facilitate this step, the questions are similar: What images arise in your mind when you look at the information uncovered in previous steps? Is there an existing work of of art (in any form) that encapsulates the feelings in which this worldview and the issue is grounded? Are there any myths or folk stories that come to mind? Step 6: Invite the participants to reflect on the layered reality they uncovered; ask if there is anything missing, and what their emotional and rational reactions are. 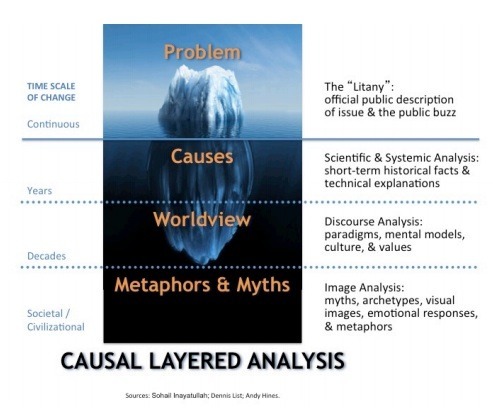 Frame this technique as a part of causal layered analysis, where new possibilities and scenarios are uncovered in response to a current (undesirable) situation. Identify an issue, system, worldview and/or myth that is constraining or problematic in the present. Consider doing this by following the steps outlined in uncovering causality. Horizontal alternatives: Take one layer at a time and ask: How could we look at this (issue, system, worldview, myth) differently? What other points of view or perspectives could we take? How could it be otherwise? What would have to change to make this happen? What would happen if these alternatives prevailed and became dominant? Identify what relevant alternatives there might be on different layers. Diagonal scenarios: Begin with the myth layer that you identified in step 2 and create an alternative story or image that reflects the wishes of the group. Build the new scenario from the myth layer upwards. Ask which worldviews this myth would give rise to. Which systems and social structures would be shaped by this worldview? For example, what would the news or current affairs look like in this world – which issues, solutions and facts would be reported?